There could soon be a trade alliance between Beijing, Moscow and Berlin—but you wouldn’t know it from the triumphal tone in Washington. Its likelihood is being seriously discussed at the highest levels in Beijing and Moscow, and viewed with interest in Berlin, New Delhi and Tehran. But don’t mention it inside Washington’s Beltway or at NATO headquarters in Brussels. There, the star of the show today and tomorrow is the new Osama bin Laden: Caliph Ibrahim, aka Abu Bakr al-Baghdadi, the elusive, self-appointed beheading prophet of a new mini-state and movement that has provided an acronym feast—ISIS/ISIL/IS—for hysterics in Washington and elsewhere. No matter how often Washington remixes its “Global War on Terror,” however, the tectonic plates of Eurasian geopolitics continue to shift, and they’re not going to stop just because American elites refuse to accept that their historically brief “unipolar moment” is on the wane. For them, the closing of the era of “full-spectrum dominance,” as the Pentagon likes to call it, is inconceivable. After all, the necessity for the indispensable nation to control all space—military, economic, cultural, cyber and outer—is little short of a religious doctrine. Exceptionalist missionaries don’t do equality. At best, they do “coalitions of the willing” like the one crammed with “over 40 countries” assembled to fight ISIS/ISIL/IS and either applauding (and plotting) from the sidelines or sending the odd plane or two toward Iraq or Syria. So how does full-spectrum dominance apply when two actual competitor powers, Russia and China, begin to make their presences felt? Washington’s approach to each—in Ukraine and in Asian waters—might be thought of as divide and isolate. In Russia’s western borderlands, the Obama administration has stoked the embers of regime change in Kiev into flames (fanned by local cheerleaders Poland and the Baltic nations) and into what clearly looked, to Vladimir Putin and Russia’s leadership, like an existential threat to Moscow. Unlike the United States, whose sphere of influence (and military bases) are global, Russia was not to retain any significant influence in its former near abroad, which, when it comes to Kiev, is not for most Russians, “abroad” at all. From Beijing’s point of view, the Ukraine crisis was a case of Washington crossing every imaginable red line to harass and isolate Russia. To its leaders, this looks like a concerted attempt to destabilize the region in ways favorable to American interests, supported by a full range of Washington’s elite from neocons and Cold War “liberals” to humanitarian interventionists in the Susan Rice and Samantha Power mold. Of course, if you’ve been following the Ukraine crisis from Washington, such perspectives seem as alien as any those of any Martian. But the world looks different from the heart of Eurasia than it does from Washington—especially from a rising China with its newly minted “Chinese dream” (Zhongguo meng). In this sense, though you wouldn’t know it if you only followed the American media or “debates” in Washington, we’re potentially entering a new world. Once upon a time not so long ago, Beijing’s leadership was flirting with the idea of rewriting the geopolitical/economic game side by side with the United States, while Putin’s Moscow hinted at the possibility of someday joining NATO. No longer. Today, the part of the West that both countries are interested in is a possible future Germany no longer dominated by American power and Washington’s wishes. Moscow has, in fact, been involved in no less than half a century of strategic dialogue with Berlin that has included industrial cooperation and increasing energy interdependence. In many quarters of the Global South this has been noted and Germany is starting to be viewed as “the sixth BRICS” power (after Brazil, Russia, India, China and South Africa). The country’s number one priority remains domestic and focused on carrying out President Xi’s economic reforms, while increasing “transparency” and fighting corruption within the ruling Communist Party. A distant second is the question of how to progressively hedge against the Pentagon’s “pivot” plans in the region—via the build-up of a blue-water navy, nuclear submarines and a technologically advanced air force—without getting so assertive as to freak out Washington’s “China threat”-minded establishment. In a reverse Marco Polo-style journey, remixed for the Google world, one key Silk Road branch will go from the former imperial capital Xian to Urumqi in Xinjiang Province, then through Central Asia, Iran, Iraq and Turkey’s Anatolia, ending in Venice. Another will be a maritime Silk Road starting from Fujian province and going through the Malacca strait, the Indian Ocean, Nairobi in Kenya, and finally all the way to the Mediterranean via the Suez canal. Taken together, it’s what Beijing refers to as the Silk Road Economic Belt. China’s strategy is to create a network of interconnections among no less than five key regions: Russia (the key bridge between Asia and Europe), the Central Asian “stans,” Southwest Asia (with major roles for Iran, Iraq, Syria, Saudi Arabia and Turkey), the Caucasus and Eastern Europe (including Belarus, Moldova and, depending upon its stability, Ukraine). And don’t forget Afghanistan, Pakistan and India, which could be thought of as Silk Road plus. Silk Road plus would involve connecting the Bangladesh-China-India-Myanmar economic corridor to the China-Pakistan economic corridor, and could offer Beijing privileged access to the Indian Ocean. Once again, a total package—roads, high-speed rail, pipelines and fiber optic networks—would link the region to China. The $400 billion “gas deal of the century,” signed by Putin and the Chinese president last May, laid the groundwork for the building of the Power of Siberia pipeline, already under construction in Yakutsk. 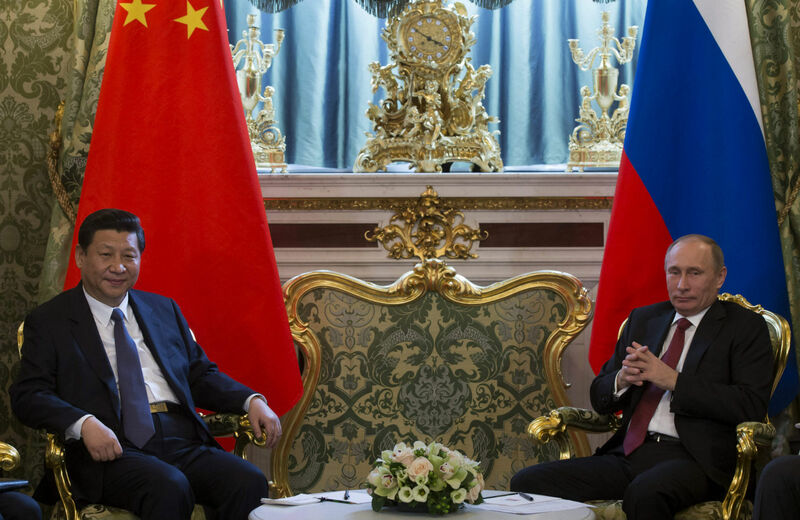 It will bring a flood of Russian natural gas onto the Chinese market. It clearly represents just the beginning of a turbocharged, energy-based strategic alliance between the two countries. Meanwhile, German businessmen and industrialists have been noting another emerging reality: as much as the final market for made-in-China products traveling on future new Silk Roads will be Europe, the reverse also applies. In one possible commercial future, China is slated to become Germany’s top trading partner by 2018, surging ahead of both the United States and France. A potential barrier to such developments, welcomed in Washington, is Cold War 2.0, which is already tearing not NATO, but the EU apart. In the EU of this moment, the anti-Russian camp includes Great Britain, Sweden, Poland, Romania and the Baltic nations. Italy and Hungary, on the other hand, can be counted in the pro-Russian camp, while a still unpredictable Germany is the key to whether the future will hold a new Iron Curtain or “Go East” mindset. For this, Ukraine remains the key. If it is successfully Finlandized (with significant autonomy for its regions), as Moscow has been proposing—a suggestion that is anathema to Washington—the Go-East path will remain open. If not, a BMB future will be a dicier proposition. After all, Berlin has not shown overwhelming concern for the rest of the crisis-ridden EU (three recessions in five years). Via a much-despised troika—the European Central Bank, the International Monetary Fund and the European Commission—Berlin is, for all practical purposes, already at the helm of Europe, thriving, and looking east for more. In a blaze of media attention, the recent NATO summit in Wales yielded only a modest “rapid reaction force” for deployment in any future Ukraine-like situations. Meanwhile, the expanding Shanghai Cooperation Organization (SCO), a possible Asian counterpart to NATO, met in Dushanbe, Tajikistan. In Washington and Western Europe essentially no one noticed. They should have. There, China, Russia and four Central Asian “stans” agreed to add an impressive set of new members: India, Pakistan and Iran. The implications could be far-reaching. After all, India under Prime Minister Narendra Modi is now on the brink of its own version of Silk Road mania. Behind it lies the possibility of a “Chindia” economic rapprochement, which could change the Eurasian geopolitical map. At the same time, Iran is also being woven into the “Chindia” fold. So the SCO is slowly but surely shaping up as the most important international organization in Asia. It’s already clear that one of its key long-term objectives will be to stop trading in US dollars, while advancing the use of the petroyuan and petroruble in the energy trade. Tthe United States, of course, will never be welcomed into the organization. All of this lies in the future, however. In the present, the Kremlin keeps signaling that it once again wants to start talking with Washington, while Beijing has never wanted to stop. Yet the Obama administration remains myopically embedded in its own version of a zero-sum game, relying on its technological and military might to maintain an advantageous position in Eurasia. Beijing, however, has access to markets and loads of cash, while Moscow has loads of energy. Triangular cooperation between Washington, Beijing and Moscow would undoubtedly be—as the Chinese would say—a win-win-win game, but don’t hold your breath. Instead, expect China and Russia to deepen their strategic partnership, while pulling in other Eurasian regional powers. Beijing has bet the farm that the US/NATO confrontation with Russia over Ukraine will leave Vladimir Putin turning east. At the same time, Moscow is carefully calibrating what its ongoing reorientation toward such an economic powerhouse will mean. Someday, it’s possible that voices of sanity in Washington will be wondering aloud how the United States “lost” Russia to China. In the meantime, think of China as a magnet for a new world order in a future Eurasian century. The same integration process Russia is facing, for instance, seems increasingly to apply to India and other Eurasian nations, and possibly sooner or later to a neutral Germany as well. In the endgame of such a process, the United States might find itself progressively squeezed out of Eurasia, with the BMB emerging as a game-changer. Place your bets soon. They’ll be called in by 2025.